Home→Charts I'm Watching→Are We There Yet? While it would be easy to jump on the P bandwagon right about now (and it wouldn’t take much convincing) a note of caution is in order. Why should we care? A bearish Gartley Pattern accurately forecast the 80 point drop starting March 4 — after the market had nearly recovered from the action of the previous 8 days. It’s estimated to ‘work’ about 70% of the time — house odds, if you will. A bullish Gartley Pattern that plays out successfully from 1321 could be expected to boost the SPX by a quick 24 points to 1345, with an ultimate target of 1391. I don’t believe in coincidences (unless CNBC tells me to), but 1391 also marks the upper bound of the rising wedge from Mar ’09. 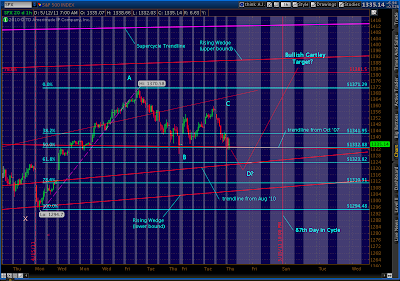 It’s also only 10 points north of the .786 Fibonacci (off the Mar ’09 lows) levels at 1381.50. If we don’t turn down from here, I expect P to finally die between 1380 – 1390 sometime in the next 10 trading days. It coincides perfectly with my 87-day cycle of downturns, but these cycles have taken up to 105 days, so it could be as late as June 3. Could a decline stall at 1321? 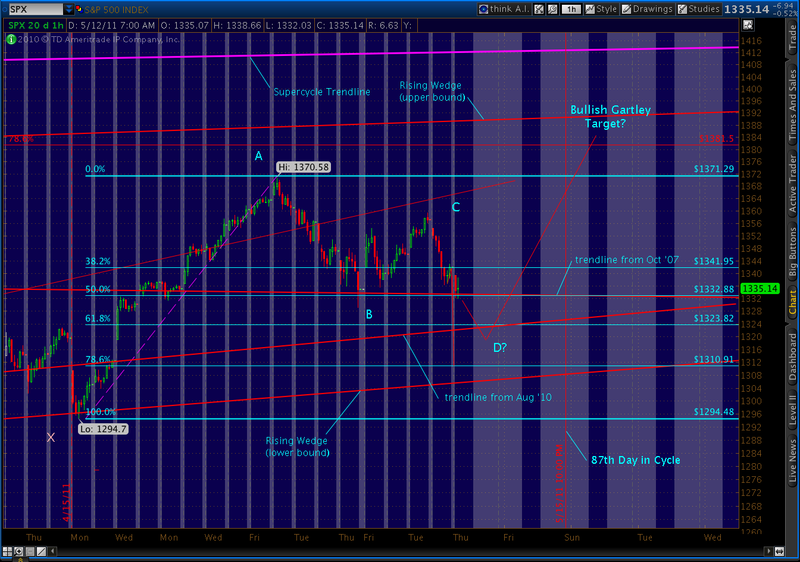 1321 is the level of the trendline beginning on 8/27/10 at 1039.70. Haven’t talked much about it, but this is a big, bad trendline of support that stopped single-day freefalls of 30 points (3/16) and 20 points (4/18) cold in their tracks. But, for now, it appears that the “trendline that just won’t quit” from the Oct ’07 1576 level will continue to support the market. Today, it stands at 1333 and seems to have rebuffed today’s running of the bears. If the decline resumes, however, keep an eye on the low 1320’s. Any stall there is likely to begin a very strong rebound and will catch many off guard. Next post: the Gartley Pattern that REALLY matters.